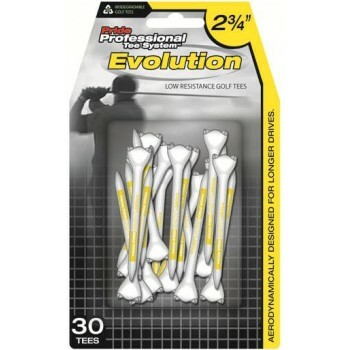 2 3/4" For most 3, 4 and 5 Woods and Drivers up to 360cc. Low resistance, aerodynamically designed color coded tees. Color Bar ensures consistent set-up each time you tee the ball up. Pride Professional Tee System Step Tees allow golfers to place their tee at a consistent height, whi..
3 1/4" Best for Drivers over 360cc. Low resistance, aerodynamically designed color coded tees. C..
Evolution now offers the perfect mix for any golfer with its new Evolution Combo Pack. Featuring&nb..